Semiconductor device fabrication is the process used to create the integrated circuits that are present in everyday electrical and electronic devices. It is a multiple-step sequence of photolithographic and chemical processing steps during which electronic circuits are gradually created on a wafer made of pure semiconducting material. Silicon is almost always used, but various compound semiconductors are used for specialized applications. The entire manufacturing process, from start to packaged chips ready for shipment, takes six to eight weeks and is performed in highly specialized facilities referred to as foundries or fabs. In more advanced semiconductor devices, such as modern 14/10/7 nm nodes, fabrication can take up to 15 weeks (about 4 months) with 11–13 weeks (3 to 4 months) being the industry average. Production in advanced fabrication facilities is completely automated, and carried out in a hermetically sealed, nitrogen environment to improve yield (number of working microchips vs the number of microchips made in a wafer) with FOUPs and automated material handling systems taking care of the transport of wafers from machine to machine. As of 2019, 14 nanometer and 10 nanometer process chips are commonly in mass production, with 7 nanometer process chips in mass production by TSMC and Samsung, although their node definition is similar to Intel's 10 nanometer process. Semiconductor device manufacturing has spread from Texas and California in the 1960s to the rest of the world, including Europe, the Middle East, and Asia. It is a global business today. The leading semiconductor manufacturers typically have facilities all over the world. Intel, the second largest manufacturer, has facilities in Europe and Asia as well as the U.S. Samsung, the world's largest manufacturer of semiconductors has facilities in South Korea and the US, TSMC, the world's largest pure play foundry, has facilities in Taiwan, China, Singapore, and the US. Qualcomm, and Broadcom are among the biggest fabless semiconductor companies, outsourcing their production to companies like TSMC. also have facilities spread in different countries. Progress of miniaturisation, and comparison of sizes of semiconductor manufacturing process nodes with some microscopic objects and visible light wavelengths. When feature widths were far greater than about 10 micrometres, semiconductor purity was not as big an issue as it is today in device manufacturing. As devices became more integrated, cleanrooms became even cleaner. Today, fabrication plants are pressurized with filtered air to remove even the smallest particles, which could come to rest on the wafers and contribute to defects. 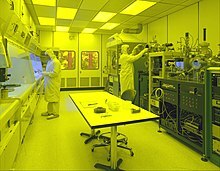 The workers in a semiconductor fabrication facility are required to wear cleanroom suits to protect the devices from human contamination. Modification of electrical properties has historically entailed doping transistor sources and drains (originally by diffusion furnaces and later by ion implantation). These doping processes are followed by furnace annealing or, in advanced devices, by rapid thermal annealing (RTA); annealing serves to activate the implanted dopants. Modification of electrical properties now also extends to the reduction of a material's dielectric constant in low-k insulators via exposure to ultraviolet light in UV processing (UVP). Modification is frequently achieved by oxidation, which can be carried out to create semiconductor-insulator junctions, such as in the local oxidation of silicon (LOCOS) to fabricate metal oxide field effect transistors. Synthetic detail of a standard cell through four layers of planarized copper interconnect, down to the polysilicon (pink), wells (greyish) and substrate (green). Once tested, a wafer is typically reduced in thickness in a process also known as "backlap", "backfinish" or "wafer thinning" before the wafer is scored and then broken into individual dice, a process known as wafer dicing. Only the good, unmarked chips are packaged. Plastic or ceramic packaging involves mounting the die, connecting the die pads to the pins on the package, and sealing the die. Tiny wires are used to connect the pads to the pins. In the old days[when? ], wires were attached by hand, but now specialized machines perform the task. Traditionally, these wires have been composed of gold, leading to a lead frame (pronounced "leed frame") of solder-plated copper; lead is poisonous, so lead-free "lead frames" are now mandated by RoHS. ^ a b Neurotechnology Group, Berlin Institute of Technology, IEEE Xplore Digital Library. “Regression Methods for Virtual Metrology of Layer Thickness in Chemical Vapor Deposition.” January 17, 2014. Retrieved November 9, 2015. ^ "8 Things You Should Know About Water & Semiconductors | China Water Risk". chinawaterrisk.org. Retrieved 2017-09-10. ^ "Top 10 Worldwide Semiconductor Sales Leaders - Q1 2017 - AnySilicon". AnySilicon. 2017-05-09. Retrieved 2017-11-19. ^ "Introduction to Semiconductor Technology" (PDF). STMicroelectronics. p. 6. ^ CNET. “Why tech pollution's going global.” April 25, 2002. Retrieved November 9, 2015.